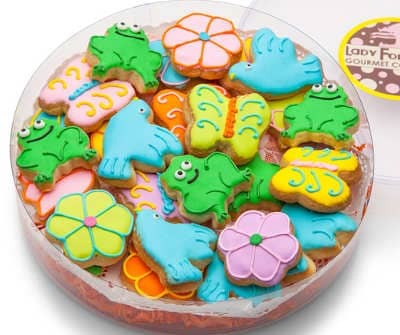 These impossibly cute sugar shortbread cookies feature assorted hand decorated spring designs including Flowers, Butterflies, Birds and Frogs. This lovely acetate container is filled with impossibly cute sugar shortbread cookies featuring assorted hand decorated Spring designs including Flowers, Butterflies, Birds and Frogs. These cookies are a perfect way to send the sweetest greetings for any Special Occasion or to welcome Spring!